http://theartmag.com/ over the counter birth control ai.type is happy to share the new ai.type keyboard 5.0 for Android! This new and exciting upgrade introduces a classical TrackPoint that we all know from physical laptop keyboards, and live animated themes that can only be implemented on a virtual keyboard. The new version introduces an inventive amoxicillin order now TrackPoint that emulates the physical TrackPoint usually found on laptops, implemented on a virtual keyboard. Users can now use a red dot in the center of the keyboard to move from one point to another in a text or a message in an easy and precise way. With so many keyboards available for Android in the Play Store, it becomes quite hard to choose the right one. If you are looking for a keyboard that gives you comfort, style and good functionality, the ai.type is the ideal one for you. Developed by ai.type, this one is a highly fluid keyboard with mind blowing predictions and much more. Of course, the traditional features like auto-complete, auto-capitalization and auto-correct have been implemented. In addition, there are a few additional features that give this one an edge over the other keyboards in the market. The first and most alluring feature is Cloud-based predictions. This means that it will use the internet to make word predictions for you. Thus, you are not confined to the vocabulary of your phone dictionary alone. Also, it comes with arrow keys and options for cut, copy and paste. There are many shortcuts and a lot of personalization that this keyboard has to offer. You can even add a picture from your own gallery for the background if you like. One of the most striking features of this keyboard is that it can be customized as per your needs. 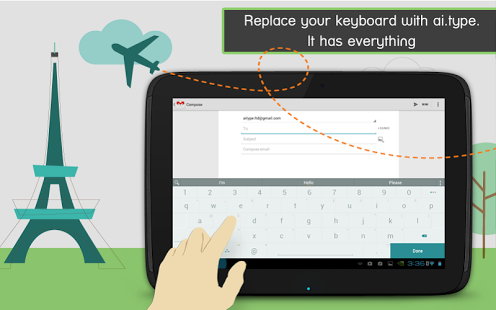 You no longer have to follow the typical keyboard arrangement. Feel free to rearrange letters as suits your need. You can add your own symbols and more. The free version of the app has eight different themes for you to choose from. There are 16 predefined fonts for you to choose between as well. 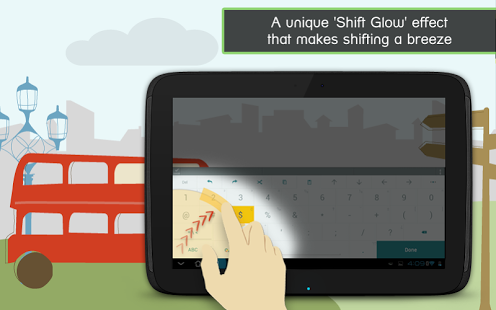 The keyboard height and the sizes of the keys can be adjusted to suit that of your fingers. There are plenty of Emoji emoticons to bring your chats to life. The text prediction abilities of the app are almost astounding. It gives an extremely high accuracy of text prediction, predicting like a psychic. With this kind of brilliant text prediction, it becomes much more comfortable and easy to type using this keyboard. As you continue to use the app, it begins to learn your style and predicts according to your style. The accuracy of the predictions increases largely with use. Another interesting feature that the app implements is a notification sound each time it auto-corrects any word for you. We have all had experiences of auto-correct starting up fights in relations because we merely forget to check on it. To avoid all this, the app gives you a notification to make sure that you are aware of the application of auto-correct, giving you a reminder to check it. This makes the app very user friendly and intuitive both. It allows runs a grammar and spelling check, which can come greatly in handy when you are typing out official mails or letters. The design of the keyboard gives a nice flat look. This not only adds to the aesthetics but also to the functionality and usability. The app requires Android 2.0.1 or higher and 12 MB of free space on your device. With so many excellent features, it sure is worth more than free. This is one app that you have to download if you text a lot on your phone. The ai.type keyboard, already among the top 10 productivity apps in over 40 countries, is a fully personalized keyboard for smartphones, tablets, that completely fits to each individual user’s style. October 11, 2014 – Following ai.type’s continuous success on Android with over 20 million users, aitype announces its long awaited advanced keyboard app for the Apple iOS8 operating system, aiming to transform the messaging experience in the Apple ecosystem. Auto-correction and prediction of the next word the user is going to write. Machine learning of the user’s unique writing style over time — improving predictive and auto-correction options. Personalized touch through themes and emojis. Now available through the Apple App Store, the ai.type keyboard app combines unique self-learning technology with advanced text prediction and completion algorithms, greatly improving user typing experience and efficiency. By combining advanced capabilities, an attractive and fun layout, along with state-of-the-art algorithm to improve writing efficiency, the ai.type has become an invaluable productivity app for millions of consumers and businesses. “With a goal of creating an app that can almost ‘read your mind’, we have developed an intuitive keyboard that makes typing a uniquely personal experience, allowing the user to express themselves exactly the way they want to,” says ai.type Co-Founder and CEO Eitan Fitusi. “Not only do we reduce the time people spend typing on their devices by around 40%, but it is also a tool that greatly improves and facilitates communication for people with disabilities,” he explains. Among the customizable aspects of this free app, users can resize the keyboard on their device to optimize the working area, choose different free keyboard themes, change colors, background pictures and keyboard patterns, and even edit the keyboard to house personalised shortcuts. “With the skyrocketing increase of messaging through smartphones and tablets — ai.type keyboard looks to continuously improve its customizable and advanced interface to remain at the forefront of improving the messaging experience,” says Mr Fitusi. With a continuing growth of more than 1 million new users per month around the world, the app’s revolutionary Artificial Intelligence software and complex mathematical algorithms seek to intuitively improve its core ‘Next Word Prediction’ and ‘Completion’ features for the iPhone and iPad. ai.type offers a revolutionary solution for typing on touchscreen devices. Combining unique technology that utilizes Artificial Intelligence and complex mathematical algorithms, ai.type has established itself as one of the most innovative and established keyboard app companies. With over 20 million users and 1 million monthly downloads on Google Play, ai,type has connected dozens of millions of users from over 100 countries around the world. El teclado para android ai.Type lanza una versión para el Mundial Brasil 2014 desde el cual podrás enterarte de horarios, resultados y más en tiempo real. ai.type es un teclado para android que añade diversas funciones al teclado tradicional de tu dispositivo, reduciendo el tiempo que gastas tecleando hasta en un 40% y para estas fechas mundialistas aprovecha la ocasión y presenta una edición de su teclado inspirado en el Mundial 2014 que te permitirá enterarte de todo lo relacionado al mundial en tiempo real. El teclado te informará cómo va el partido en tiempo real y en forma discreta. Incluso tiene la opción de escuchar un sonido de “Gol” cada vez que un equipo haga un gol. Estas funciones le permitirán estar siempre al tanto de los partidos sin tener que cambiar de aplicaciones. Gracias a la función innovadora de ai.type que predice y completa palabras podrá ser el primero de sus amigos en mandar un mensaje para celebrar el gol de su equipo. Este lanzamiento especial está incorporado en el teclado actual de ai.type e incluye funciones que desde hace tiempo agregan valor para los millones de usuarios de ai.type. El teclado ai.type cuenta con una base de usuarios de más de 15 millones y más de un millón de instalaciones al mes, los usuarios usan el teclado de ai.type un promedio de 25 veces por día. Puedes descargar el teclado para Android ai.Tpye gratis desde Playstore dando clic aquí y si ya tienes el teclado instalado puedes descargar el tema del mundial aquí. איי. אי. טייפ (ai.type) הוציאה מהדורת מקלדת חינמית מיוחדת לקראת מונדיאל 2014 למכשירי אנדרואיד, המציגה מידע על המשחקים בזמן אמת.